8BEATS takes its meaning from the subject we aim to explore in this film project: the 8 beatitudes in the new testament. In it, eight teams from all corners of the U.S. will each express the meaning of one beatitude at the beat of their own creative drums in an unprecedented collaboration of Catholic Creatives artists. Headline: Blender Pro Bold S UB-H E A D : B LENDER P RO THIN AL L C AP S Use Proxima Nova Light with a 0 tracking for body copy, and set the leading at around 150% of the type size. 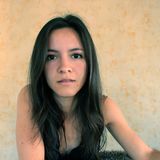 For headlines, set the tracking at 45, and the leading at 1/8 of the type size. For sub-heads, set the tracking at 100, and the leading at 1/1 of the type size. We want the cinematography to speak for itself. To that end 8BEATSâ&#x20AC;&#x2122; branding steps aside through a clean and minimalist black and white palette. 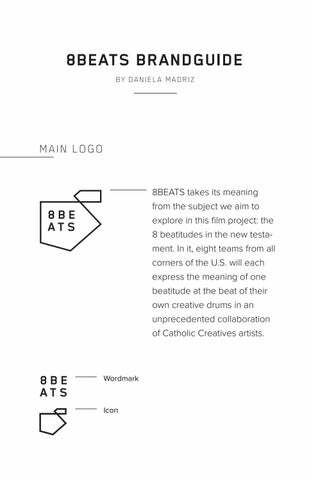 The 8BEATS brand system was designed to reference the number eight, but also to display the diversity of approaches to the beatitudes. This is why each beatitude film will have its own version of the logo, and why the logo can vary to take on new shapes and meanings. PH OT OG R AP HY All photography should be drawn from the films and their behind-the-scenes. When a logo or text is placed over an image, their darkness/lightness is set to ensure readability.